I was “HIGH” for my fortieth birthday! I feared to turn forty. I was nervous about the number. I found myself dreading the climb over the hill instead of reflecting on the roads I had previously traveled or the glorious views along the way. To help cope with the “BIG 4-0,” I wanted to get high! 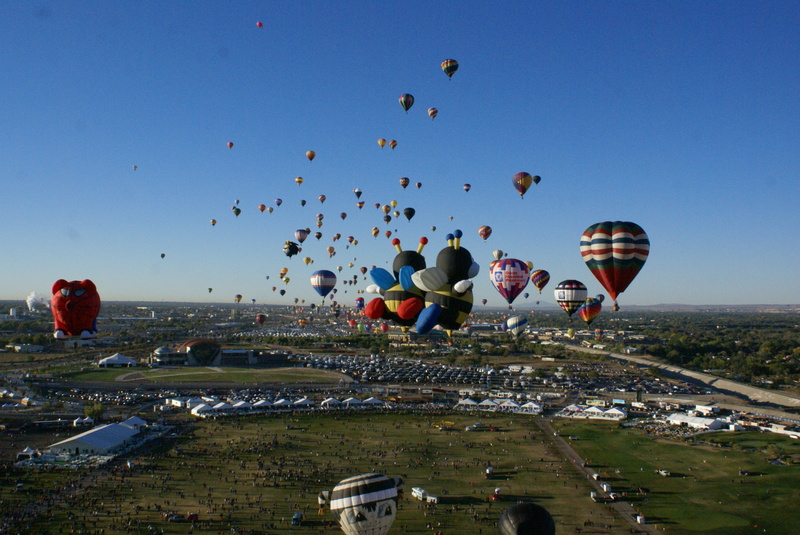 The Balloon Fiesta in Albuquerque, New Mexico is a two-week ballooning event. 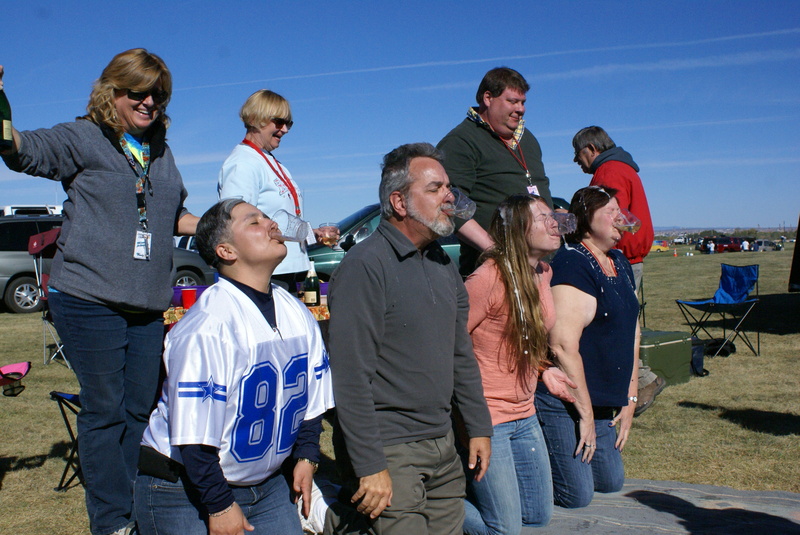 Pilots and their “Balloon Chase Crew” participate every day (weather permitting). 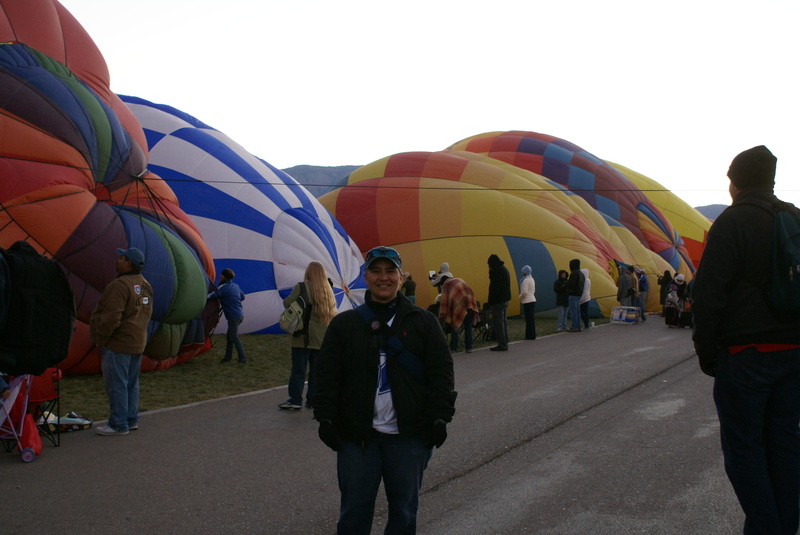 Our first day on the balloon grounds was actually day nine of the event. 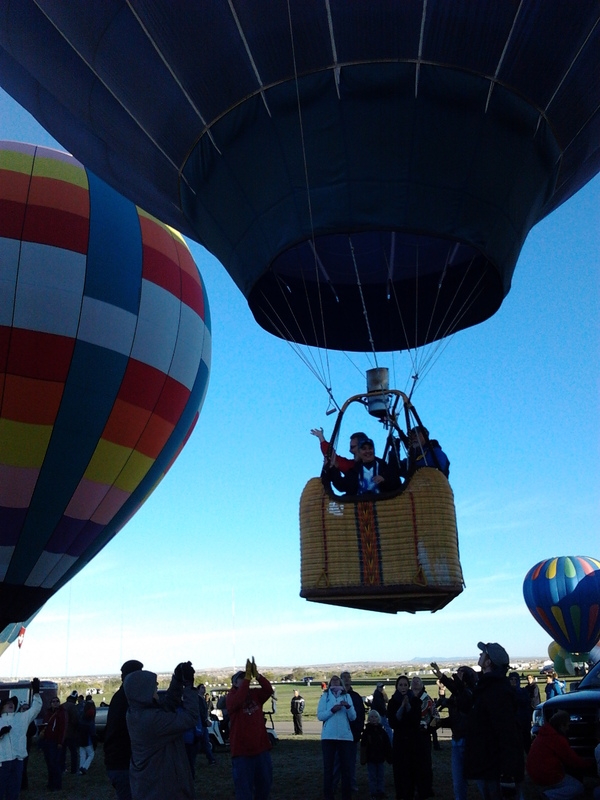 My travel group and I were invited to be a part of this year’s Balloon Chase Crew for the Mad Hatter Balloon. This was the second time I got to experience the event. 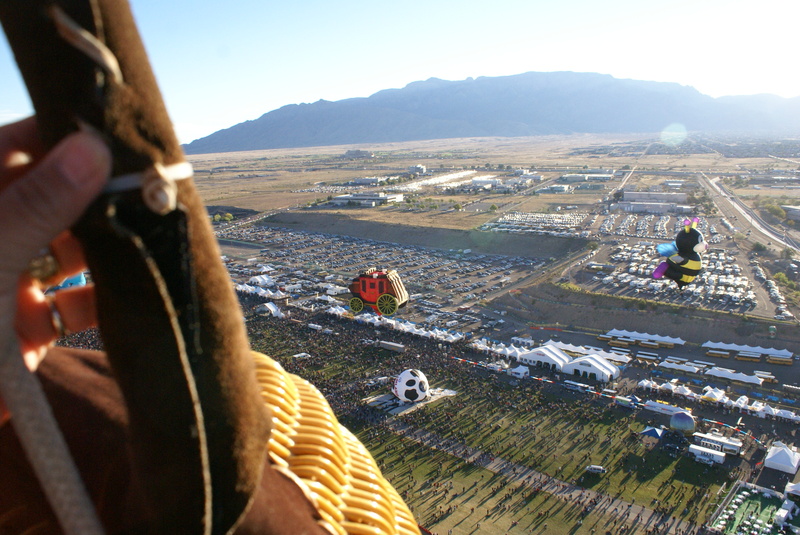 Being on the grounds, where all of the hot air balloons are, is a tremendous experience all by itself. 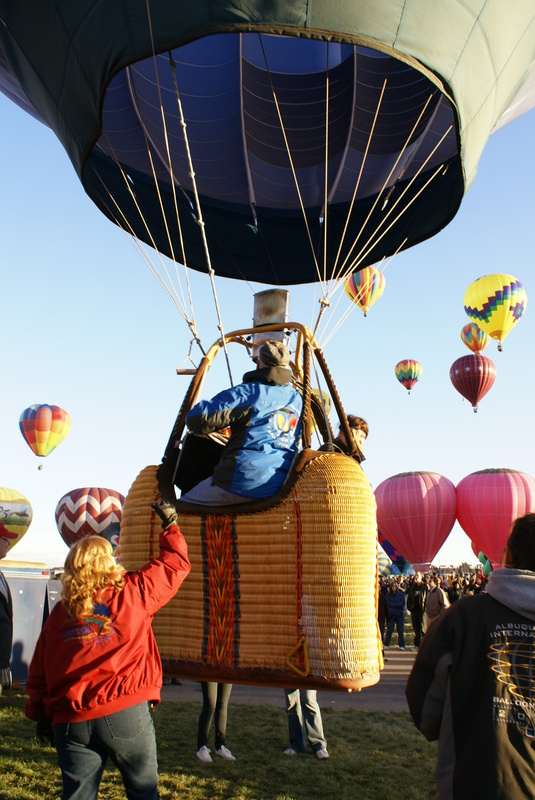 But to be a part of a Balloon Chase Crew is an experience that will stay stamped in your mind forever and ever! 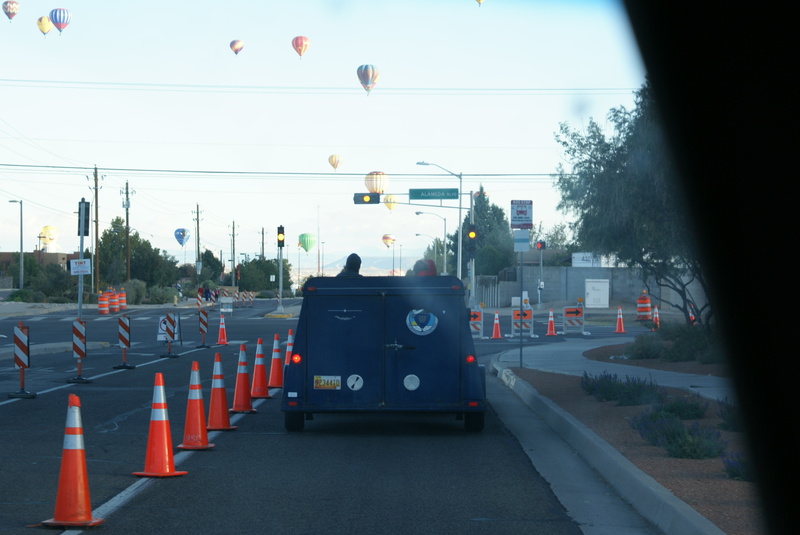 The job of a Balloon Chase Crew consists of many duties. But for the most part, it’s to ensure the safety of the pilot and his/her aircraft. 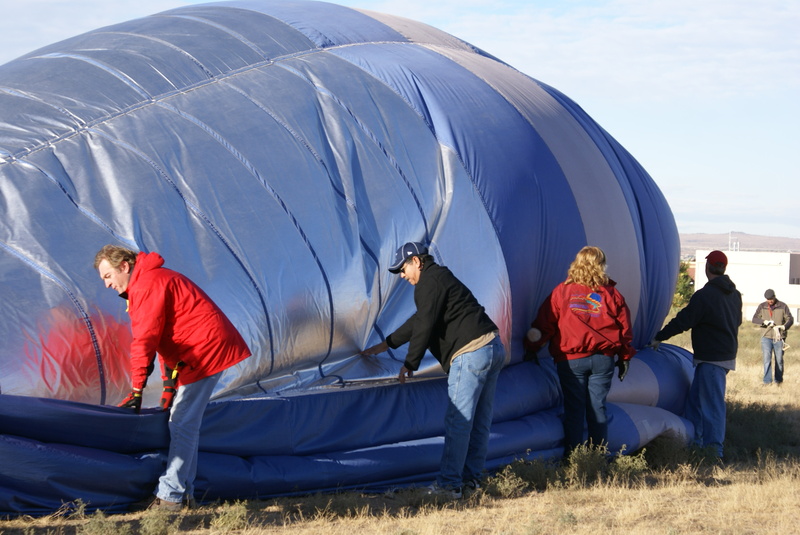 They help unload the balloon, unpack the balloon and set up the balloon. Once their pilot takes flight, the Crew hops into vehicles to follow the flight path. 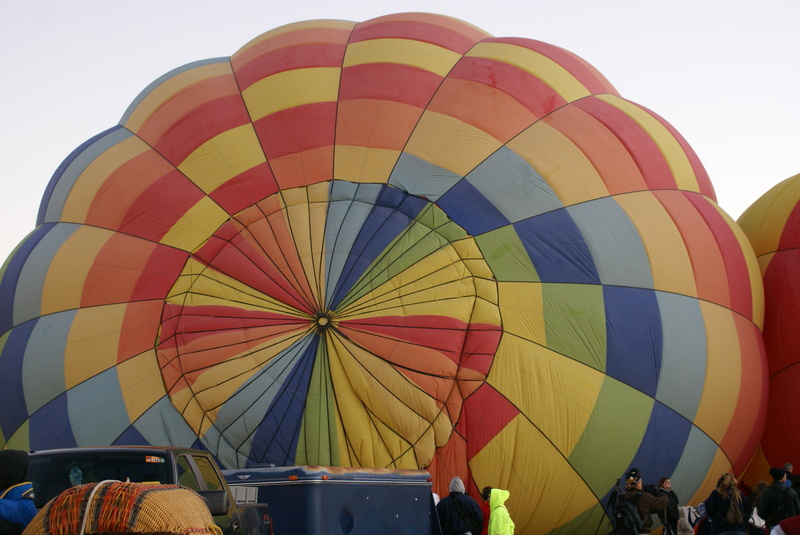 The high priority is to make sure the pilot is safe wherever he/she lands. 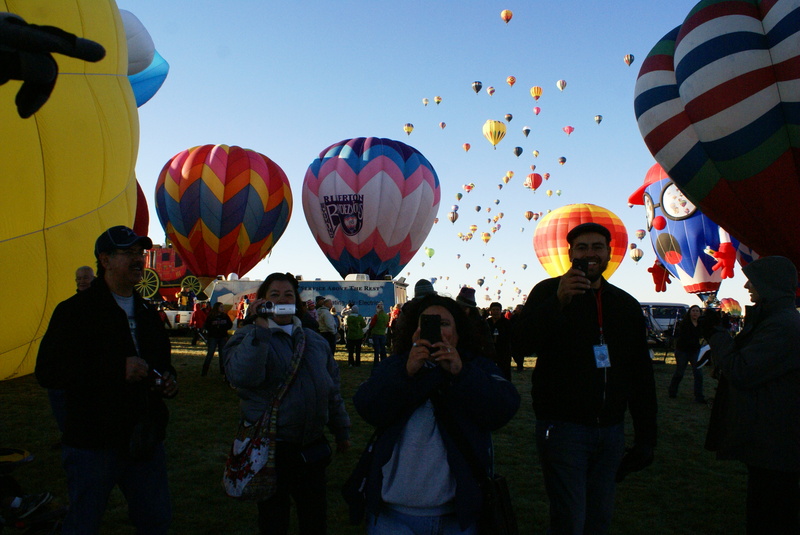 On our first day at the event, we arrived on the Balloon grounds by 6:00 AM. 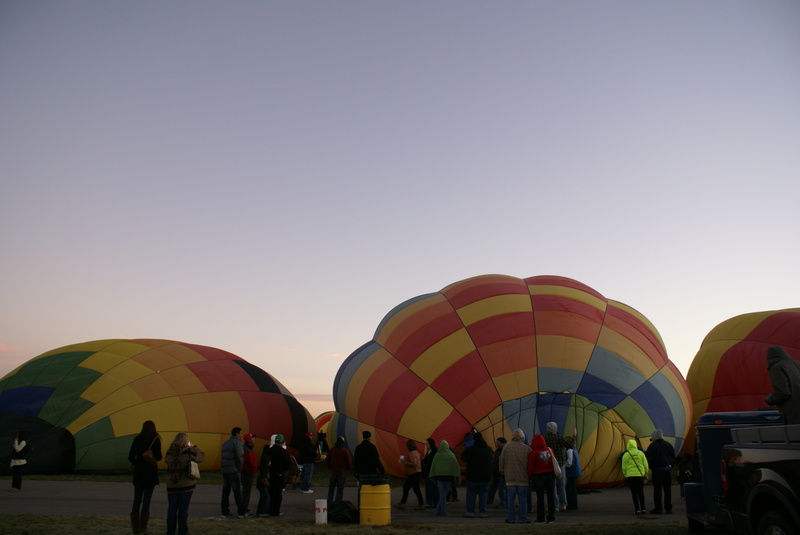 By 6:30 AM, the “Dawn Patrol” took flight to check the wind and weather conditions. 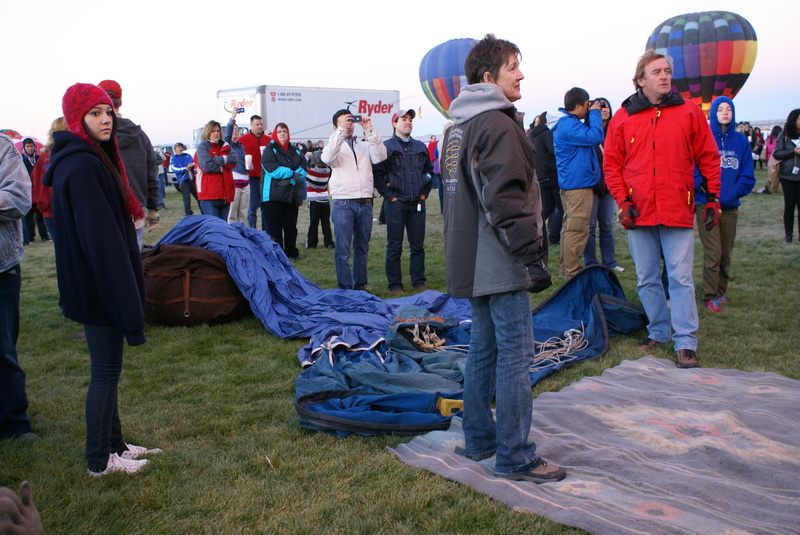 Once they gave the “go ahead,” our pilot (among many) began instructing their crew to get their balloons ready for flight. 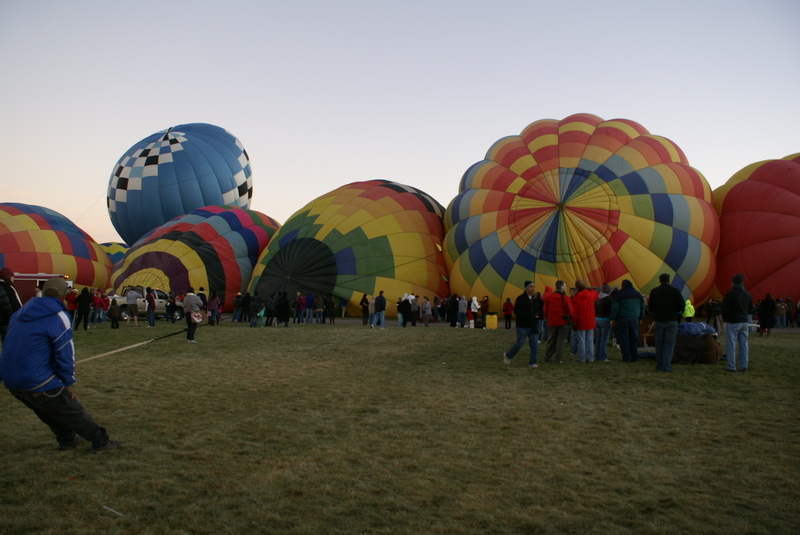 THE DAWN PATROL is a group of Balloons that go up first. 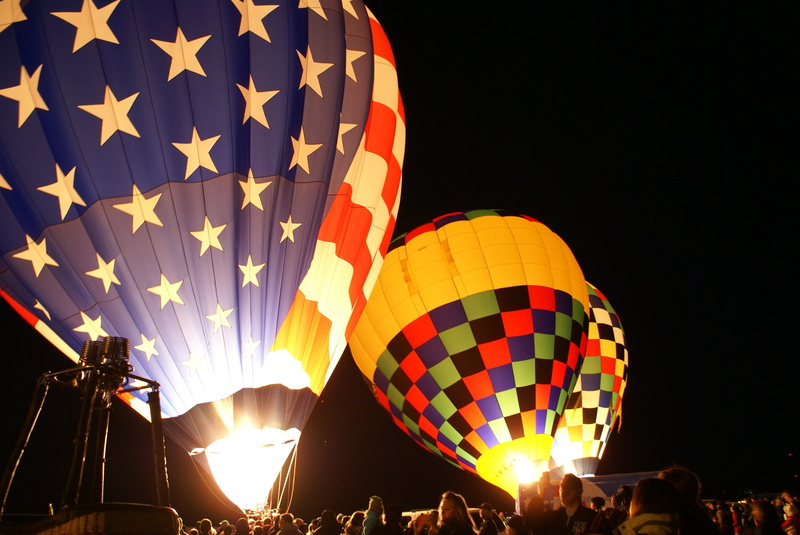 Since the sun doesn’t peek over the mountains until about 7:00 AM, the balloons glow once the burners are ignited. 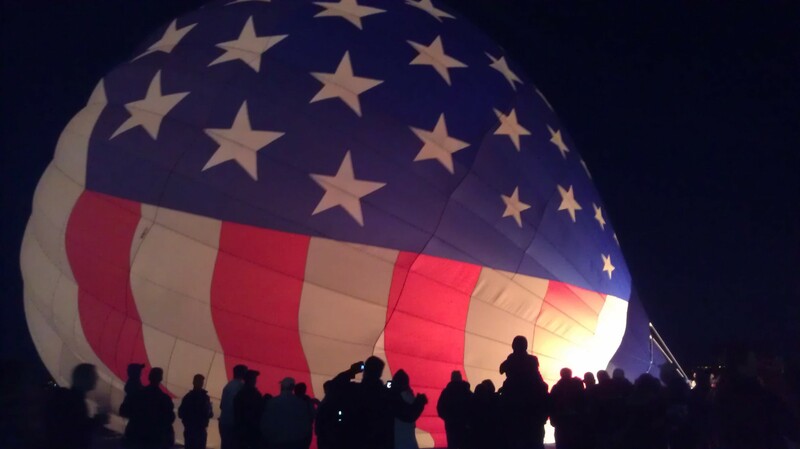 When the Dawn Patrol have their balloons inflated, an announcer will do a countdown from ten to one, and on “one,” all of the balloons will light up at the same time. It’s the most awesome sight to see! After the Dawn Patrol gives the green light for the rest of the 500+ balloons, everyone hustles to get their balloons up in the air. Most of the members of the Mad Hatter crew has been a part of the team for many years. So, we stood back and out of the way at first. Each crew member has their specific job and duty. Every part of the preparation is critical for a safe flight and landing. 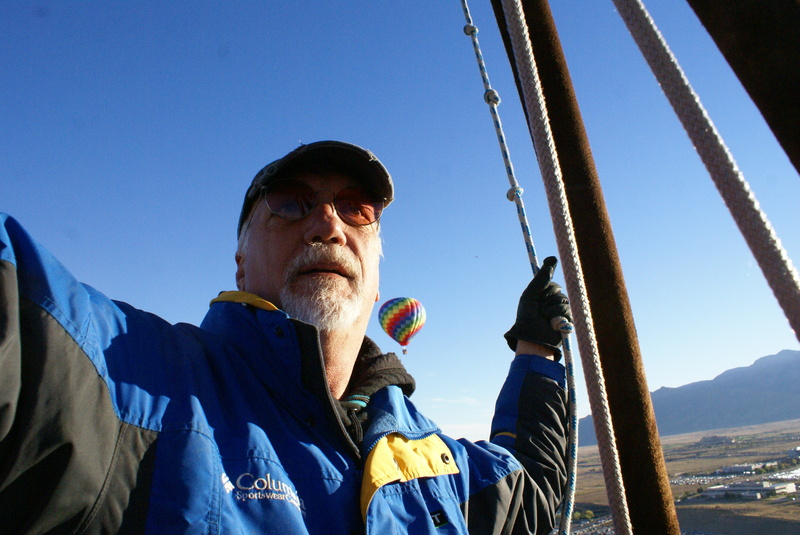 Our pilot, Mike, was scheduled to be one of the first balloons to go up for the, “Mass Ascension.” So, once he took off, we had to leave, too. We had to follow his flight path and find out where he landed. Hundreds of other crew members hit the road to chase after their pilots! It’s an adrenaline rush on the ground, can you imagine what it feels like in the air? 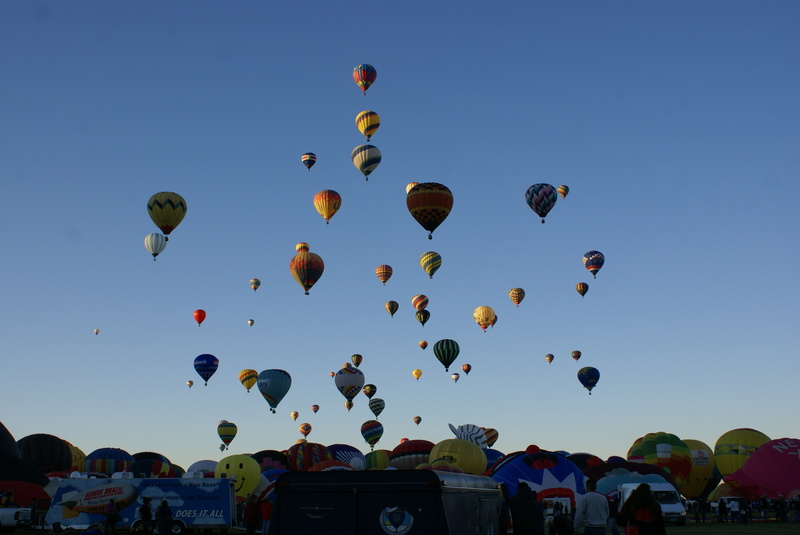 While chasing the balloon, we did get to see hundreds of other balloons up in the sky. We just missed out on watching them take off from the ground, which is okay. I was just hoping that Aunt Karen and Uncle Richard could witness the “Mass Ascension.” But again, it was a treat to even be a part of this experience. We found Mike safe on the ground with his balloon still erected. We all jumped out of the trucks to help bring the balloon down and fold it back up. WHAT A JOB! That “envelope” (balloon) is extremely heavy! 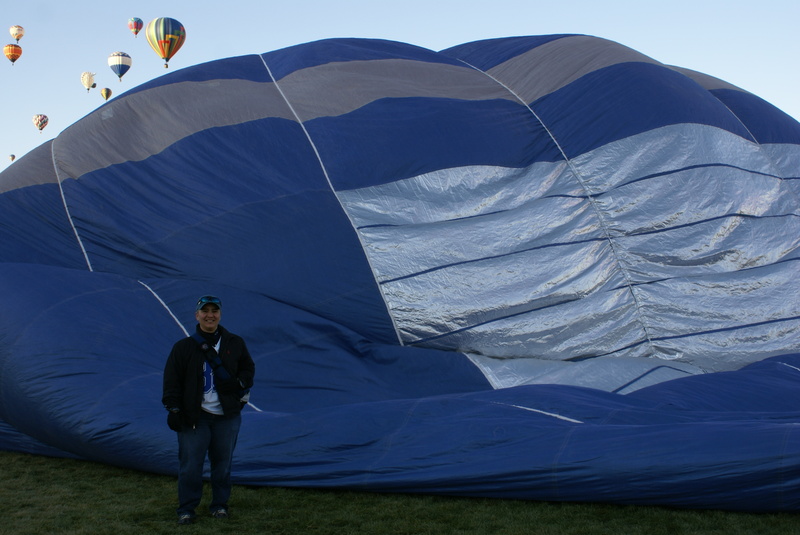 Once the balloon is packed in the bag, they bounce the bag three times and then sit on it to get the air out. VERY FUNNY TO WATCH! And this was just the FIRST day! Day two gets better! After a short debate on whether or not to participate a second time, we decided to go again. After all, that’s why we were here! 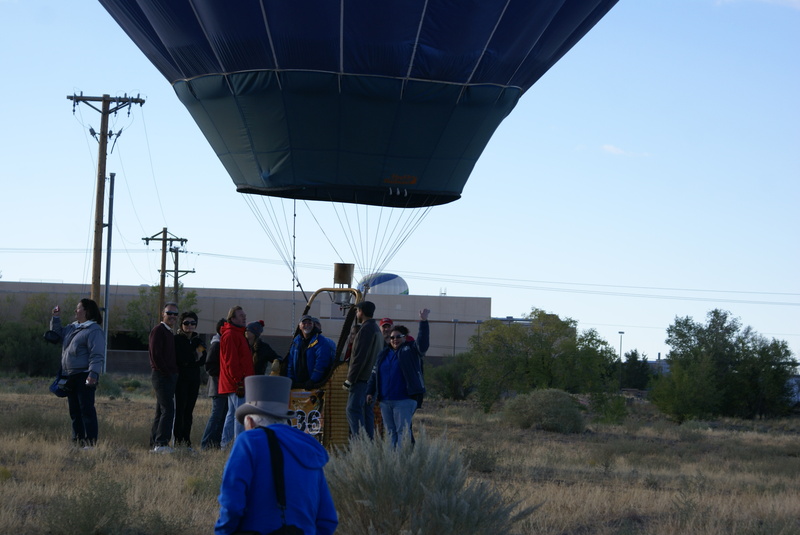 We met the Chase Crew at 6:00 AM and made our way onto the Balloon Grounds one more time. 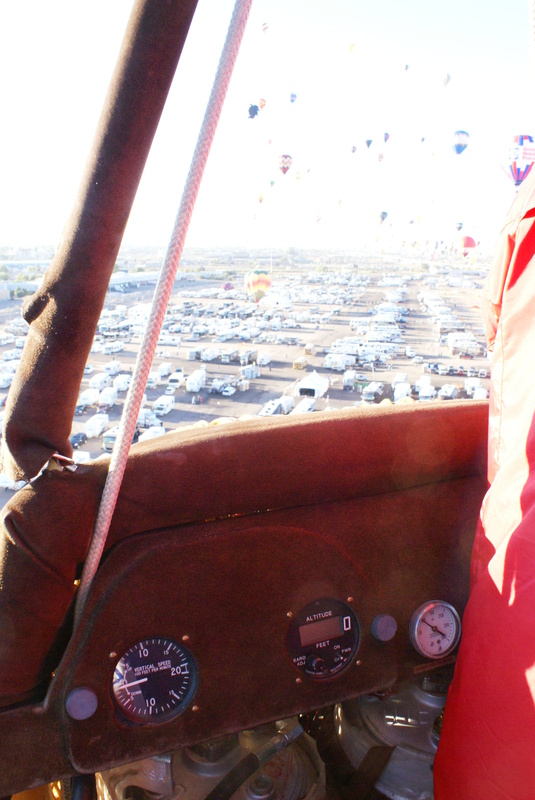 This was day ten of the event… the FINAL day… our Pilot’s last flight before he retires and sells the balloon. The glowing balloons are my favorite part. I can’t get enough of it! After the Dawn Patrol went up, they gave another, “all clear,” and the cycle started all over again. This time; however, we told a friend that we’d prefer to stay on the event grounds. 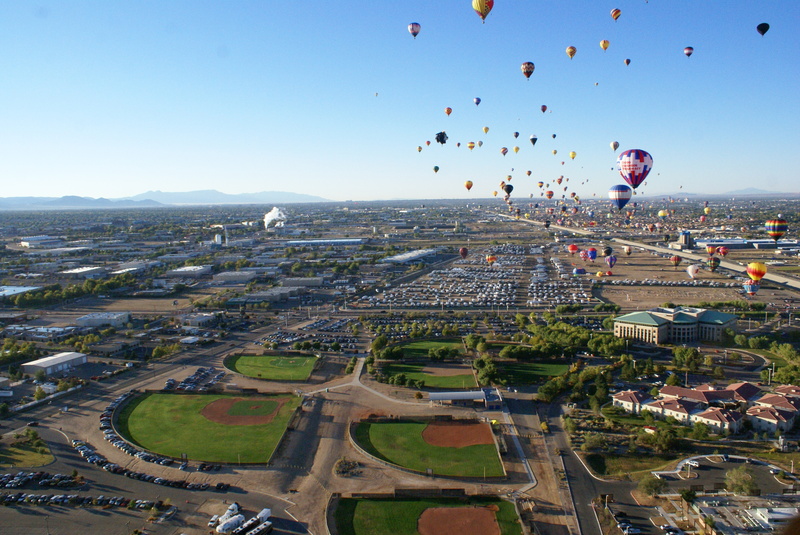 We didn’t want to miss the Mass Ascension. We opted to stay behind when the Chase Crew had to leave. 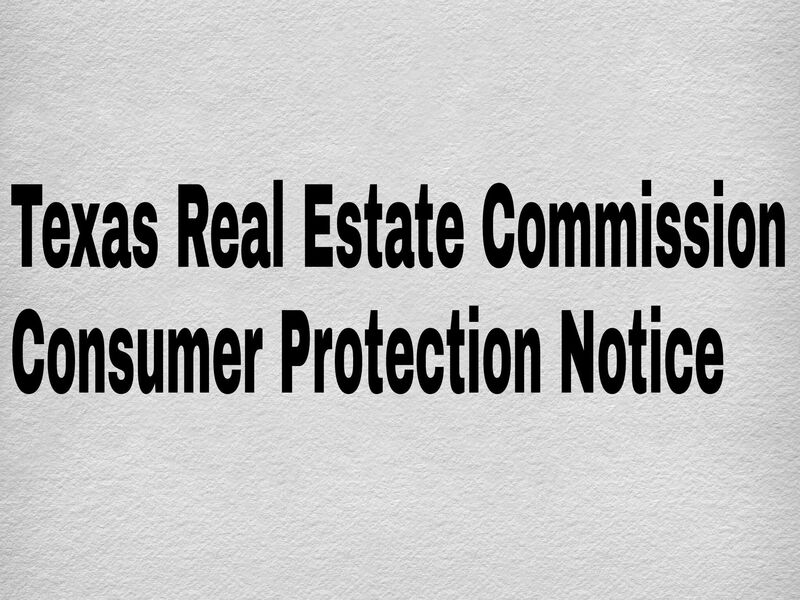 But… plans were shifted a little. Our pilot was scheduled to fly up a lot later than the day before. So, the whole crew got to watch the Mass Ascension. It was a blessing in disguise. 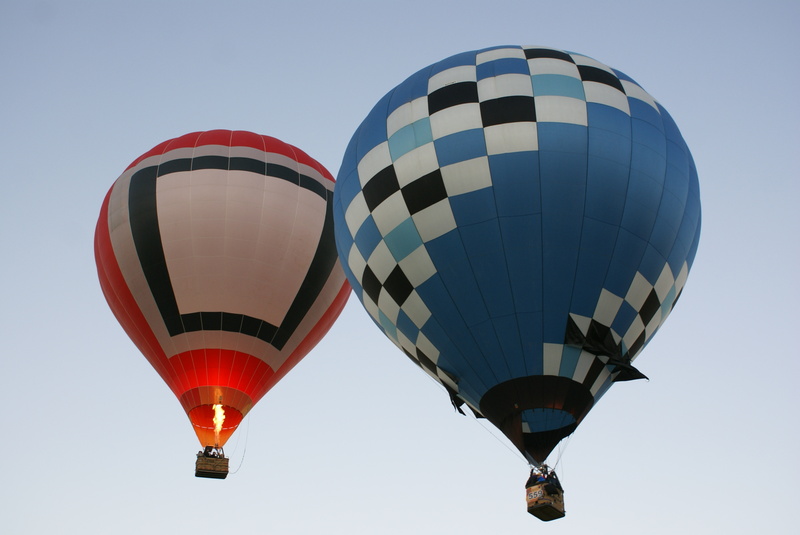 One by one, each balloon inflated and balloons began to fly in the sky. 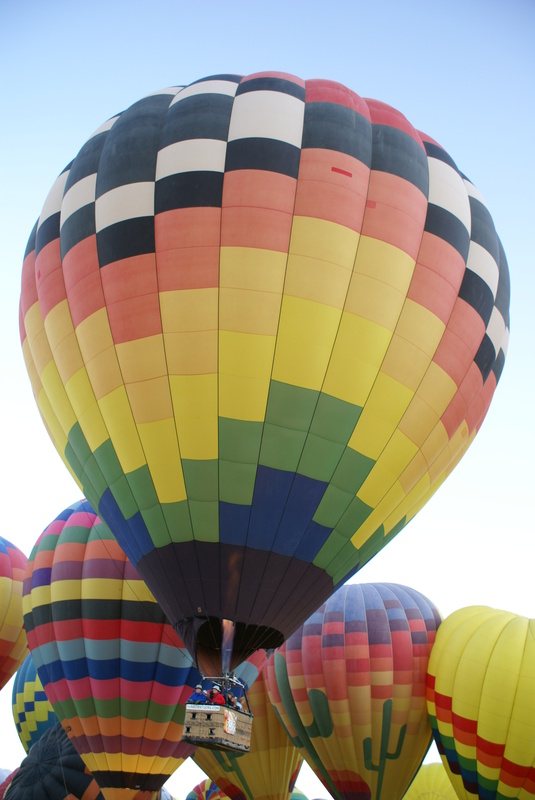 There were almost 600 balloons registered for the event. …this time I had a small feeling it could be my turn to go up. In the pit of my stomach, I felt that this could be my lucky day. Since we were fairly new to the group, I knew my chances were slim. But I still had that gut feeling. We watched the balloons all around us and took tons of photos. Although pictures can’t truly capture the glorious scene around us, we still tried to capture every breathtaking moment. O-M-G! My heart fluttered, my hands began to shake, I got weak in the knees and I grinned from ear to ear. What a fabulous surprise! What a treat! What a moment to remember! What a moment to remember that I was afraid of heights! OOPS! Who cares?!? I’m going up, up and away! I couldn’t believe it. I was so happy to have loved ones around me, but I sure did wish my parents were there to see me go up. As soon as I landed, I sent them a text with a photo, but I know it’s not the same. 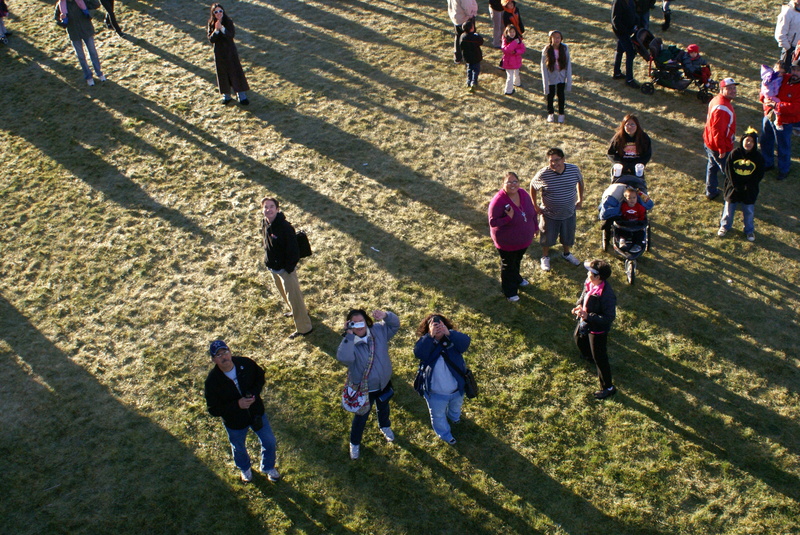 While our balloon was getting ready, we watched the other Balloons going up all around us. I was so nervous. I wanted to take photos of balloons I hadn’t seen before, but I did what I was told… I DIDN’T MOVE. I stayed close to the Gondola (the basket). I WAS NOT GOING TO MISS MY RIDE! I might look calm here, but I’m shaking in my sneakers! taking a photo of me! I was ALMOST on cloud 9! …and before I knew it… I was lifting off! My birthday wish came true! I took so many photos while I was up in the air. By the time I took a second look down to find my peeps, they were too tiny! It was then when I realized how high I really was. I kept my eyes on the balloons around us. And I survived. THIS WAS ONE OF THE BEST BIRTHDAYS EVERY! Freakin’ forty is not so bad, after all! The pilot found a safe landing site. The other passenger and I hopped out of the gondola. 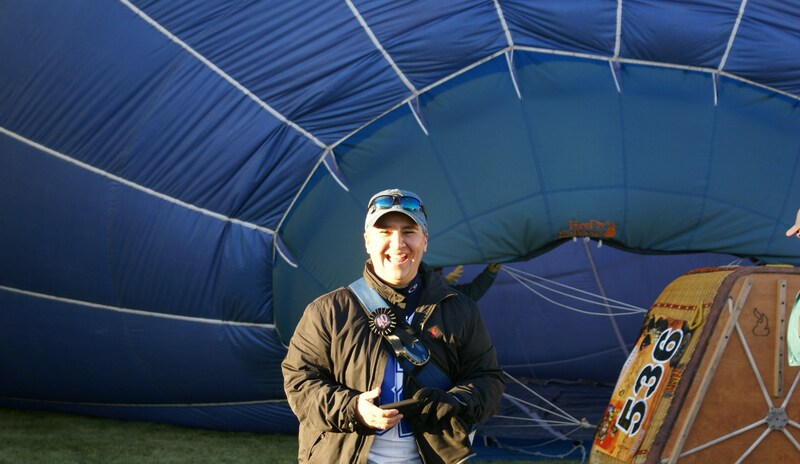 The pilot, with the help of strangers, got the balloon safe on the ground. I remained weak in the knees… I was high as a kite! What a day. 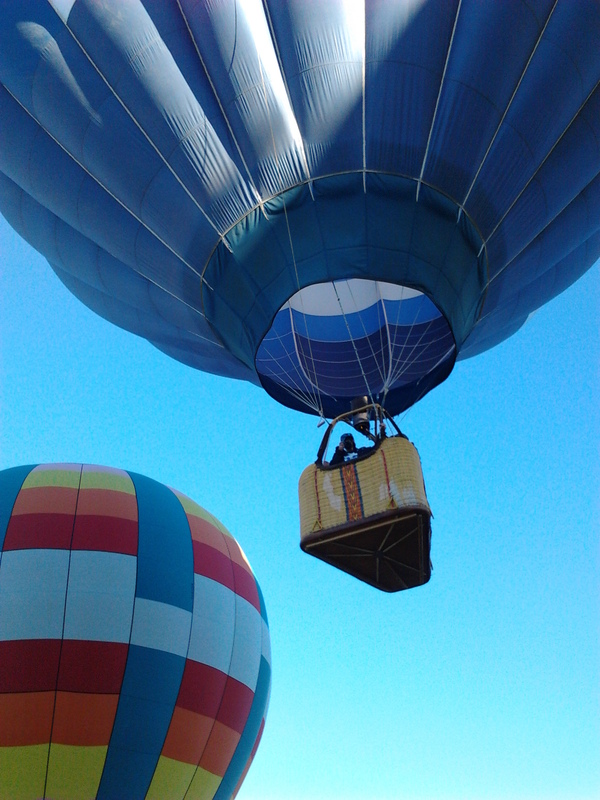 After our ride, we headed back to the Balloon grounds. 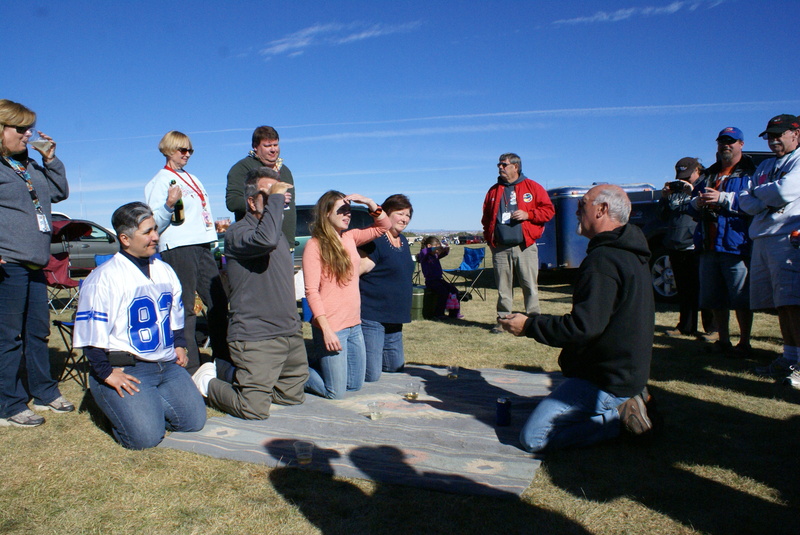 I, along with the other first-time flyers, was asked to kneel in front of the pilot. There was a drinking cup in front of each of us. In a bar, a group of men sat at a table in front of a fireplace. One flicked a piece of paper into the fire and they noticed that the piece of paper floated in the air above the flames. Curious, they did it again, but with more than one tiny piece of paper. And again, the papers floated above the flames. “Hmmm…” they thought. “Let’s get an envelope and set it in the fire to see if it floats.” Of course, the flames were not what made the paper ascend. The paper caught fire. They realized it was the heat. So, they did it on a larger scale. They made a larger envelope and used more heat and lo and behold, the envelope floated away. 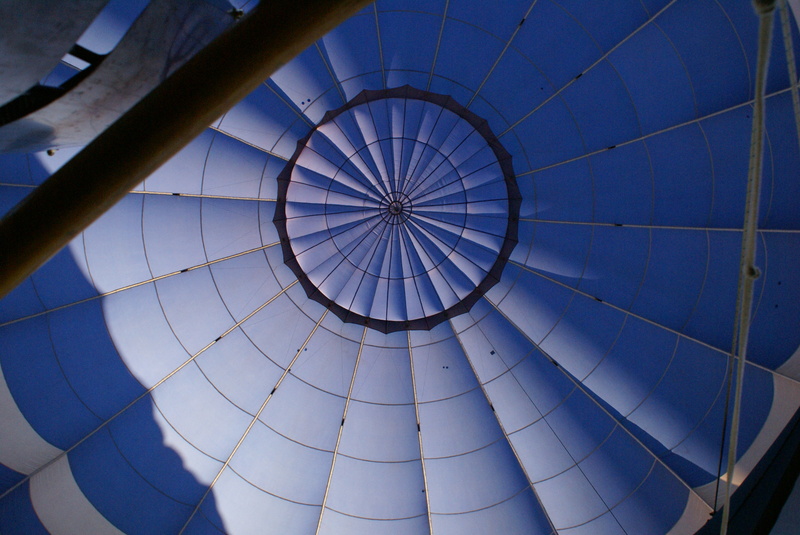 On an ever grander scale, they designed an envelope… the first hot air balloon. The burner created enough heat for the balloon to travel quite a distance. BUT… as the balloon floated overhead, the villagers, who had no idea what was going on, saw this “thing” flying with fire blowing and they thought it was a dragon. So when the balloon landed, they ran to the “dragon” and killed it with their pitchforks! 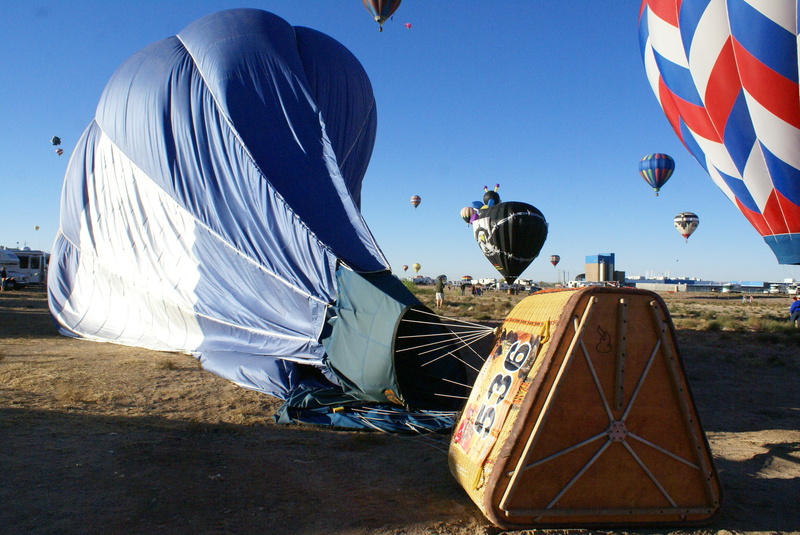 The balloonists would find their balloons ripped to shreds. 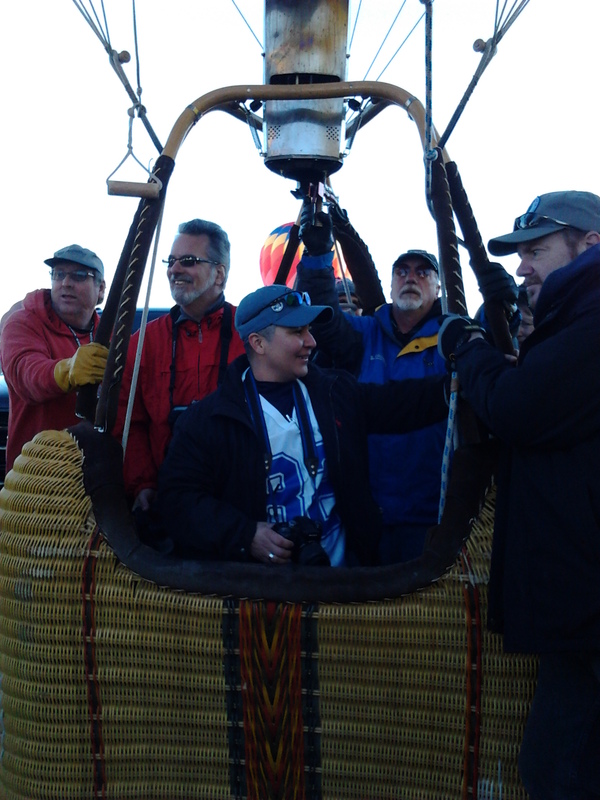 So… one day, after a successful flight, the balloonists decided to offer the villagers champagne as a token of good faith. They hoped that the champagne toast would prevent the villagers from attacking the “dragon.” It worked. Ever since (and even until now), when a pilot has a safe landing, they share a toast with their crew. As the pilot shared this story, someone began pouring champagne into our cups. The pilot went on to say that the drink is not only to celebrate the safe landing but to wish good luck for the next flight. He told us we had to bend over, while kneeling, and take our cup by our mouth. We were to slowly lift our heads and take the drink without spilling one drop. The success of the next flight relied on our successful drink. I’m competitive. We all bent over and placed our mouths on the cups. We slowly raised our heads and drank our champagne as everyone cheered us on. On my left side, I heard spills. I thought to myself, “HA! Someone couldn’t do it.” And I continued to drink. Little did I know… the people behind us began pouring champagne on our heads! I almost drowned! LOL (no, really). It was funny and such a weird feeling. Yes, and I’m wearing my brand spanking new Dallas Cowboy Jersey! Oh, what an experience! It was better than I could ever imagine! 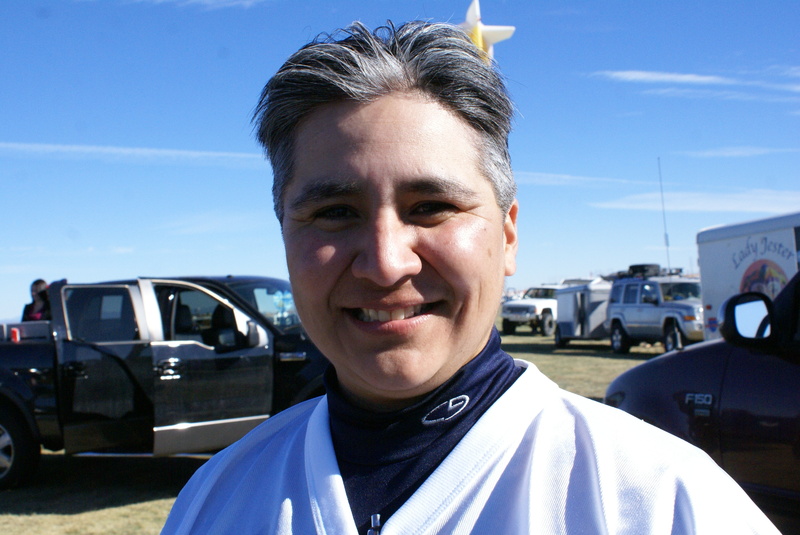 A shout out to John Rodriguez (the hook-up in Albuquerque) who took really good care of us. If it wasn’t for him, we wouldn’t have had this opportunity! John, thank you for everything you did for all of us! And thank you for my surprise birthday cake! My, oh, my… you outdid yourself, my friend.